notes must be considered before venturing into breeding this exquisite bird. Homing Pigeons is a breed of rock pigeon that is basically trained to return to its own home. According to researchers, the reason why they are able to return to their homes is because they follow certain navigation cues. These include the earth’s magnetic field, the topography or landmarks of a certain area, the position of the sun, and the ultraviolet light patterns found in the sky. These birds have been used in the olden days as messengers by carrying letter to and fro. However, at present, they are messengers no more. They are already considered as one of the many most requested pets. In raising homing pigeons, there are many considerations before choosing which one to have. One consideration would be the ease in raising the pet. Of course, it would be very beneficial to the owner if the animal to be raised requires no complexities in their day to day activities. Fortunately, raising homing pigeons is just as easy as one, two, and three. Upon purchasing the pigeon, one must technically buy at least a pair of pigeons. 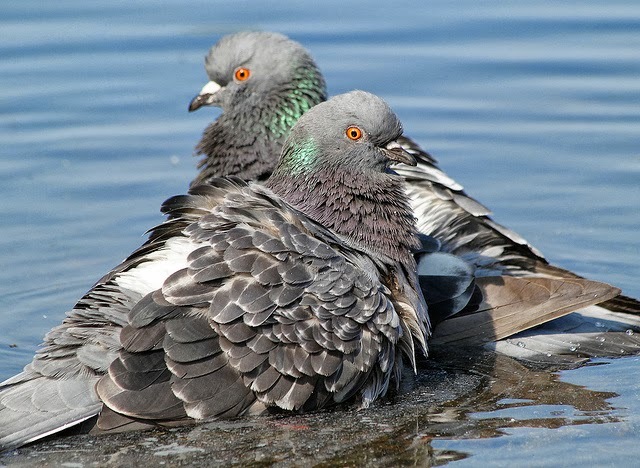 Paired pigeons are necessary to generate offspring and to have them multiply. If no paired pigeon is available, then acquire at least an equal number of male and female pigeon. Thus, raising homing pigeons should be kept or housed in the same room for them to be able to mate. When you notice one pigeon to be sick, or does not seem to be in good condition, it is best to isolate that pigeon. This will prevent any spread of disease, if really does exists. As an owner you must also keep a record of the number of days in between each egg laying and hatching period. Apart from this, another record of the chicks’ weight, the number of chicks born alive, and also the number of deaths must also be maintained. This will enable you to identify which pigeon is productive or not, and which is sickly and poor in health or performance. Raising Homing Pigeons – What are the YES’ and NO’s in feeding them? must be whole. It should neither be broken into smaller pieces nor should it be in powder form. It should be prepared and fed as it originally is. 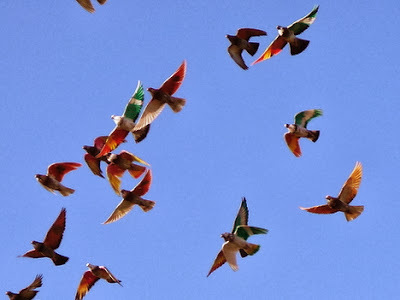 Some form of grains that are suitable for these pigeons include the following: corn, sorghum, soybean, rice, and legume seeds. Pigeons are considered as hungry eaters. They eat at almost any time of the day, whenever they feel like it. Having stated this, their food must be placed in an area where it is accessible to them. This area must have no barriers for them to be able to eat freely as they please. In raising homing pigeons, how should their house be like? A pigeon’s house must be spacious, but not necessarily too large. It must be big enough for air to freely come and go. Most of the times, when many raising homing pigeons are contained in a single area, they tend to become mischievous in moving from here and there. An airy and spacious place for them would be advantageous to the owner. On the flooring of a pigeon’s house, there must be clean dry sand. This will serve as a play area for them. Here, they can roll and pick up stones or pebbles with their beaks. This applies for young pigeons. However, for adult pigeons, an elevated loft must be prepared. The adult ones are those who are capable of laying eggs already. They will be in need of a higher area to keep their eggs in safety as both parents take turns in warming the eggs. You must secure that before egg laying period, leaves must be scattered in the coop of the pigeons. The nest of the adult pigeon is usually made of twigs, leaves, and grasses. This gives them the feeling of being one with nature. The nests must be craftily made, because this will serve as the house of the young for about 25 to 32 days. Homing pigeons are known to be energetic breeder producing 4 to 5 batches of young in a year. Thus, their nest must be well made. What bathing process must be observed in raising homing pigeons? bathed personally by the owners. In fact, they do it themselves. Adult pigeons usually bathe themselves in containers provided by the owners. Homing pigeons love to take a bath. In preparing a bathing container for your pets, you need to consider its size. The container must be more or less 7.5cm deep. The depth of the container gives them ease in taking a bath. Their likes to take a bath enable them to become healthier and stronger. Just like a human’s perception on a practicing clean hygiene, homing pigeon’s frequent bathing keeps them away from diseases. For the record, it is best suggested to have the pigeons bathe 2 to 3 times in a week. 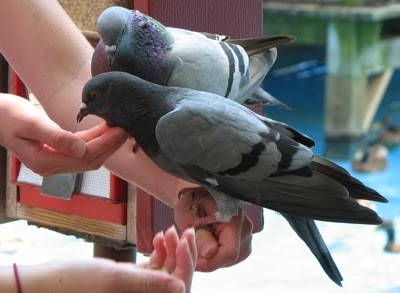 Aside from bathing, pigeons must also be checked by veterinarians on a regular basis to further enhance their health conditions. There is really no formula on raising a pet, whatever animal it may be. For all kinds of pet, all there is to do is to fulfill the requirements needed by them. This may include providing them proper food at all times which will in turn give them the minerals they need, water, and clean and safe housing. For homing pigeons, enough nesting materials are also a must. Without these, they would not be able to produce young properly. Fulfilling these requirements will guarantee you a happy place, with homing birds as your pet. Lastly, a personal requirement of becoming a pet owner is responsibility. You must be responsible enough to watch over your pets, and see to it that their needs are well attended. With all these, you are all set in raising homing pigeons.